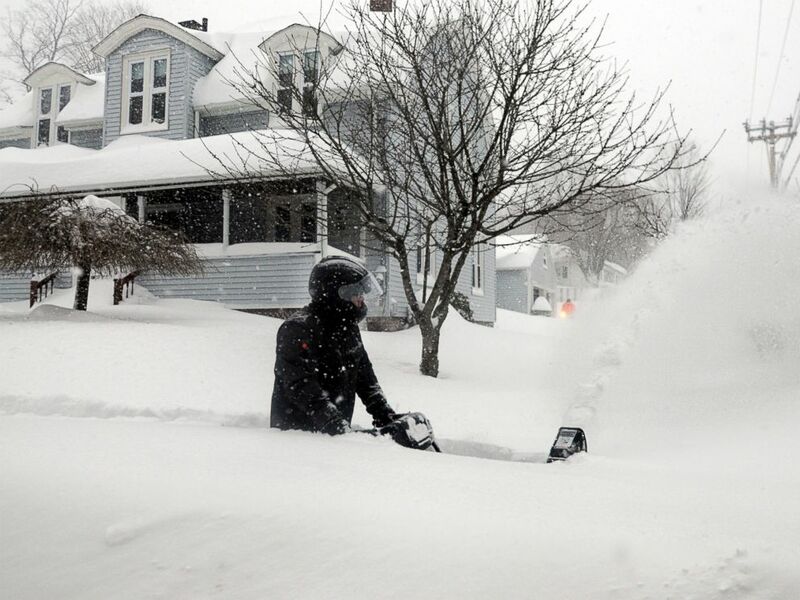 Coastal New England continued to get walloped today by as much as two-and-a-half feet of snow as a massive Nor'easter blew through with blizzard conditions. Snowfall totals were up to 32.5 inches in Auburn, Massachusetts, 30.5 inches in Thompson, Connecticut, 28.5 inches in Orient, New York, and 23.3 inches of snow at Boston's Logan International Airport, with snow continuing to fall. "I want to make it clear to everyone in Boston that we're still in the middle of a winter storm of historic proportions," Boston Mayor Marty Walsh said shortly after 3:30 p.m. The city feared an additional six inches of snowfall, Walsh added, with snowy conditions expected late into the evening. He said City Hall would remain closed Wednesday, and encouraged private employers to stay closed or let employees work from home. 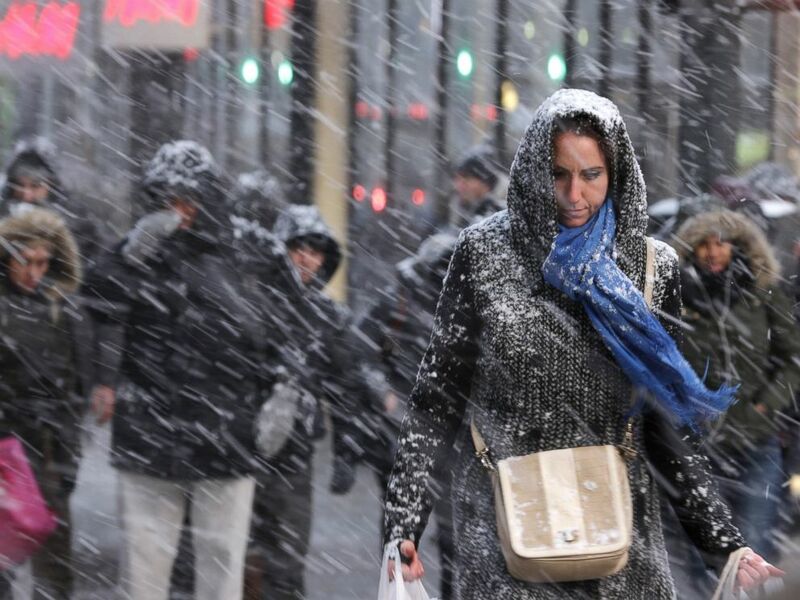 Travel bans and mass transit shutdowns remained in effect in the region, though they had been lifted in areas further south and west that were spared the worst of the storm. Airlines were expected to begin flying at Logan Wednesday morning and to have full schedules back in place by Thursday, according to an airport official. Nevertheless, Walsh recommended Boston-area residents continue to stay in their homes Wednesday, though Gov. Charlie Baker said they would no longer be required to stay off the roads. "I've signed an executive order that would lift the travel ban as of midnight. With that said, it's very important that people keep in mind there is a tremendous amount of cleanup that remains to be done. Unless you have a reason to be out tonight or tomorrow after midnight, we would encourage you not to be," Baker said. John Slasell wades through waist-deep snow as he snow blows the sidewalk along Slater St. in Webster, Mass. Strong winds and coastal flooding were reported from the coastline of Long Island, New York, to Massachusetts. Wind gusts reached 60-75 mph. Winter storm warnings continued from Long Island to Maine, and blizzard warnings from Rhode Island to Maine. The storm's heaviest snow bands stayed north and east of New York City, leaving the nation's biggest metropolis at the lower end of the snow forecast. Snowfall at LaGuardia Airport, in the relatively heavy-hit eastern New York borough of Queens, stood at 11 inches. Fearing the worst late Monday, officials shut down mass transit systems from New York City to Boston, and closed roads to traffic in all or parts of five states. Thousands of flights were canceled because of the storm. In all, seven states -- including Pennsylvania, New Jersey, Rhode Island and New Hampshire -- declared states of emergency. 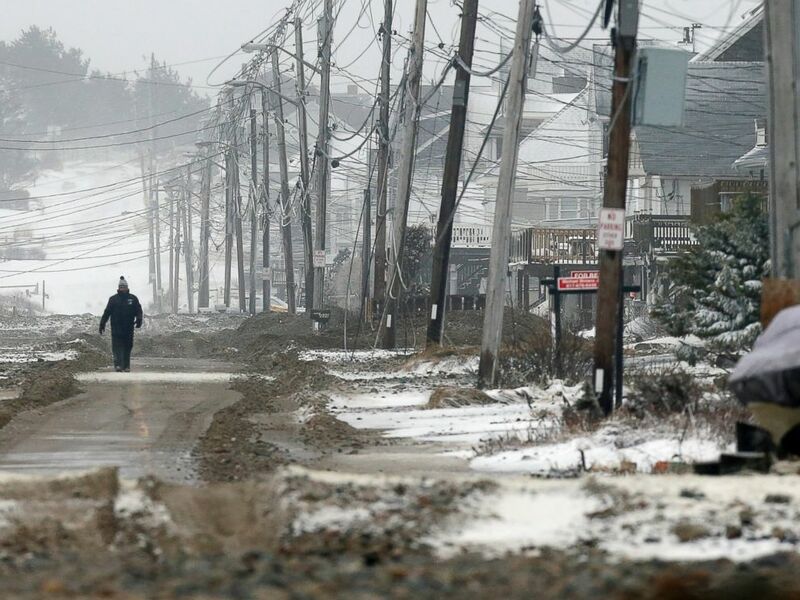 A man walks on a portion of road cleared of sand washed up by ocean waves during a winter storm in the Humarock section of Scituate, Mass., Jan. 27, 2015. After a huge snowfall failed to materialize in some cases, officials in some Northeast cities and states lifted their travel bans today and defended their decision to impose them in the first place. "My job as a leader is to make decisions, and I will always err on the side of safety or caution," New York Mayor Bill de Blasio said. "To me, it was a no-brainer. We have to take precautions to keep people safe." Added National Weather Service Director Louis Uccellini, "As a result of these decisions and compliance from the public, we've seen far fewer storm related deaths, traffic accidents and traffic jams than previous winter storms of a similar nature." With the storm still raging this morning in Connecticut and travel bans still in effect there, Gov. Dannel Malloy told reporters, "Under normal circumstances, we would have expected hundreds of accidents on or highway system. Last night, we had 11." New York City announced it was reopening roads and restarting Staten Island ferry service as of 7:30 a.m., and later restarted subway service. New York Gov. Andrew Cuomo lifted travel bans in Dutchess, Orange, Putnam, Rockland, Ulster, Westchester and Nassau counties, and said systems operated by the Metropolitan Transportation Authority, which includes the New York subway, began coming online by 9 a.m., with service reaching a Sunday level -- about 60 percent of a normal weekday -- by noon. 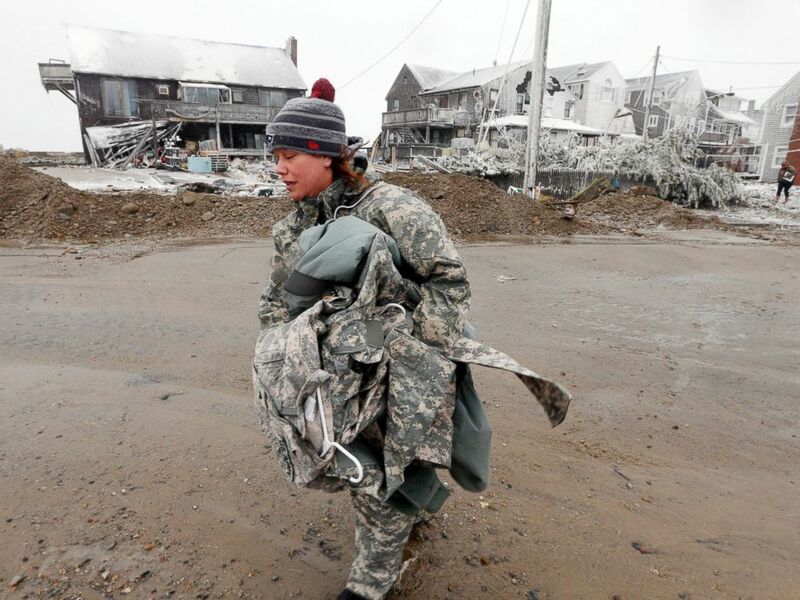 U.S. Army soldier Jennifer Bruno carries some belongings from her house, center rear, that was heavily damaged by storm surge during a winter storm, Jan. 27, 2015, in Marshfield, Mass. All Port Authority bridges and tunnels reopened, and PATH rail service was being restored. Cuomo this morning said drivers should expect delays because many roadways were still covered with snow. "The roads are still dangerous. They are passable, but there is a level of ice under the snow in many areas," Cuomo said. Gov. Chris Christie said New Jersey lifted its travel ban in all 21 counties. This afternoon, Massachusetts Gov. Charlie Baker lifted travel bans in the western counties of Berkshire, Hampden, Hampshire and Franklin, though a ban remained in effect for I-90, even in western Massachusetts. 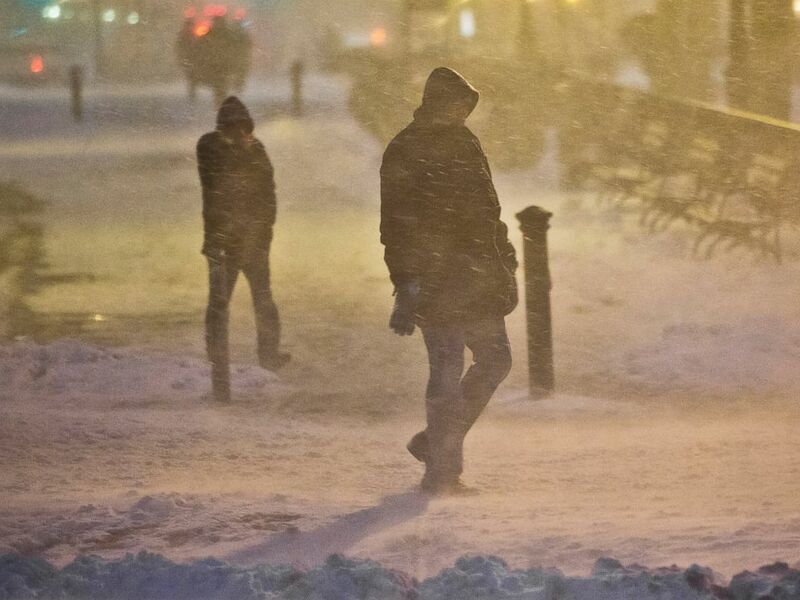 Pedestrians walk through wind-swept snow, Jan. 26, 2015, in Brooklyn, New York. According to the National Weather Service, the storm was departing the Northeast south of New England more quickly than expected, resulting in significantly less snowfall than some forecasters predicted. "The science of forecasting storms, while continually improving, still can be subject to error, especially if we're on the edge of the heavy precipitation shield," the National Weather Service wrote. "Efforts, including research, are already underway to more easily communicate that forecast uncertainty." However, Uccellini noted that the worst predictions came true for parts of New England. The overnight hours brought some of the storm's most treacherous conditions, with wind gusts of up to 78 miles per hour reported on Nantucket Island, Massachusetts. More than 7,000 flights were canceled because of the storm, which began as a clipper system that brought snow and slick roads to the Midwest on Sunday. Travelers should check with their specific airline for how to change or cancel their flight and get the latest updates on any travel advisories. Meanwhile, New York City's streets were coated in a slushy mix overnight, with few vehicles on the roads. According to the MTA, this is believed to be the first time the entire New York subway system as well as bridges and tunnels were shut down because of a winter storm. The last subway shutdown was when Superstorm Sandy hit in 2012. A 17-year-old teen on New York's Long Island died in a sledding accident, authorities said, marking the first death reported in the storm. The accident happened at 10 p.m. Monday in the town of Huntington, New York, according to the Suffolk County Police Department. The teen and two friends were taking turns snow-tubing when one of the teens lost control and struck a light pole, police said, adding that the teen was transported to a nearby hospital, where he was pronounced dead. On Long Island, the snow was matched with heavy winds, making the conditions especially worrisome and limiting visibility. Pedestrians make their way through snow in New York, Jan. 26, 2015.